Today was Day #5 of Chocolate and Quinoa Theme Week. 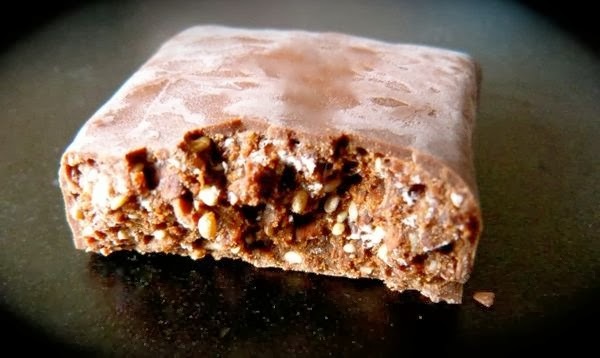 This raw cacao protein bar from YogaEarth (Venice, CA) had a slightly fermented taste. I couldn't make up my mind whether I liked this taste or not. 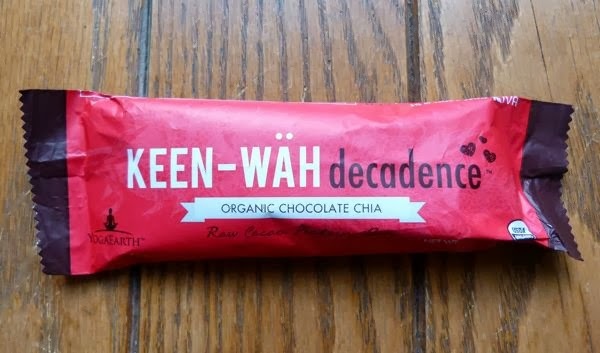 Some bites of this bar had more of a chocolate covered quinoa crunch. Other bites contained hints of dried fruit/almond butter and/or chia seeds. YogaEarth is one of a handful of similar companies that have created products with natural ingredients: nuts, seeds, cacao, dried fruit (often gluten free and vegan) -- designed to "optimize health," promote sustainable living and to give back to a designated cause or audience. According to the label on today's bar, "one percent of sales supports Kiva." Healthy is good; and I've always liked chocolate, nuts and seeds. A bar like this, combined with plenty of fresh fruit and vegetables, may even help compensate for the rare burger I might eat.